BRUSSELS—The European Commission (EC) yesterday released carbon dioxide (CO 2) emissions data and compliance status for 2005―the first year of the Emissions Trading Scheme (ETS)―showing that 99 percent of industrial installations in Europe have fulfilled their obligations under a scheme designed to minimise the economic costs of the EU’s Kyoto commitments and creating an internal market enabling companies to trade CO 2 emissions. Under the scheme, launched on January 1st 2005, industrial installations are required to report their actual emissions at the end of each calendar year, assure independent verification of their reports, and submit them to the competent national authorities by March 31st. Companies then have one month to surrender the number of emission allowances equivalent to their verified emissions in the previous year. For the scheme’s first trading period of 2005 to 2007, the 21 Member States with active emissions registries have allocated an annual average of 1,829.5 million allowances to industrial installations. Four Member States—Cyprus, Luxembourg, Malta, and Poland—do not yet have operational emission allowance registries. Emissions for the industrial installations operating in the 21 countries amounted to 1,785.3 million tonnes of CO2 for 2005. With regard to reporting 2005 emissions, 8,980 industrial installations, which account for 99 percent of all allowances allocated, have fulfilled their obligations according to the EC. Eight hundred and forty-nine industrial installations have been identified as not having surrendered a sufficient number of emission allowances, although many of these have indeed recently fulfilled their obligation. For those industrial installations that remain in non-compliance, the EC will contact Member States asking them to identify the reasons and to ensure appropriate enforcement action. Reports revealing that German industry has released far less CO2 than allowed under the ETS sent carbon prices dropping just before the weekend of May 12th. CO2 prices reached a one-year low at EUR 9.25 a tonne. The price of CO2 had already crashed to EUR16.50 at the end of April 2006 following news that Estonia, France, the Netherlands, the Czech Republic and Belgium’s Walloon region all had a surplus of carbon allowances. The EU ETS is based on the assumption that creating a price for carbon through the establishment of a market for emissions reductions offers the most cost-effective way for EU countries to meet their obligations under the Kyoto Protocol and move towards a low-carbon economy. The scheme was established through Directive 2003/87/EC proposed by the EC and approved by all the EU Member States and the European Parliament. 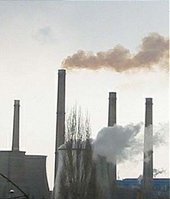 During the first trading period, from 2005 to 2007, the EU ETS covers only CO2 emissions from large emitters in the power and heat generation industry and in selected energy-intensive industrial sectors such as combustion plants, oil refineries, coke ovens, iron and steel plants, and factories making cement, glass, lime, bricks, ceramics, and pulp and paper. This apparently limited scope covers more than 12,000 industrial installations in the 25 members states and accounts for approximately 40 percent of the EU’s total CO2 emissions, or approximately 30 percent of its overall greenhouse gas emissions. Since its launch in 2005, the ETS has revealed potential fundamental weaknesses as a measure to combat climate change. Indeed, the high price of CO2 allowances through 2005 would have, if long-term predictability were in place, created incentives for some of the investments necessary to reduce CO2 emissions by 60 to 80 percent in the next five decades. However, uncertainty about future allocations has made long-term investments such as carbon capture and storage (CCS) too risky, although the price of CO2 was high. In the long-term, high CO2 prices might result in carbon leakage because industries exposed to global competition will tend to invest in non-ETS countries. However, with the recent drop in prices, carbon leakage will not occur to the same extent. “The problem, however, is that low CO2 prices delay the urgent, necessary investments in CCS, renewables, and hydrogen, that are absolutely necessary for the development of a sustainable energy chain,” said Bellona expert Marius Holm. The EC will submit a mid-term review of the scheme soon—likely around the middle of 2006—to allow for fine-tuning based on the experience gained, and to consider whether the scheme should be extended to other sectors, such as chemicals, aluminum, and transport, and to more greenhouse gases. How will the EU pay for demonstrating CO2 capture and storage?